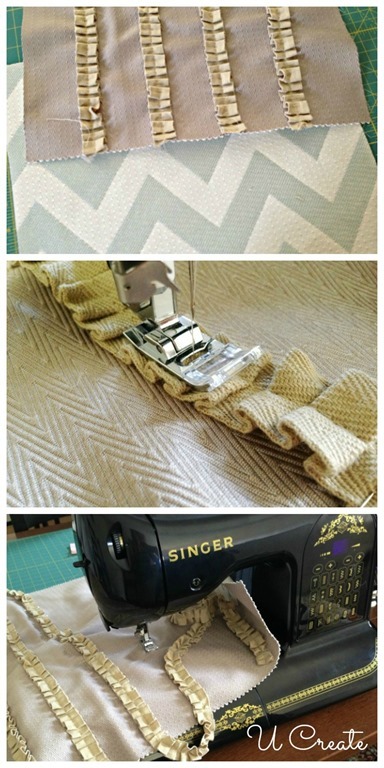 This past week I have been sewing every day and loving it! I don’t get the chance to sew as much as I’d like, but playing in the HGTV Home Magic Challenge with Jo-Ann has motivated me to sew my little heart out! Let me show you one of my finished projects. 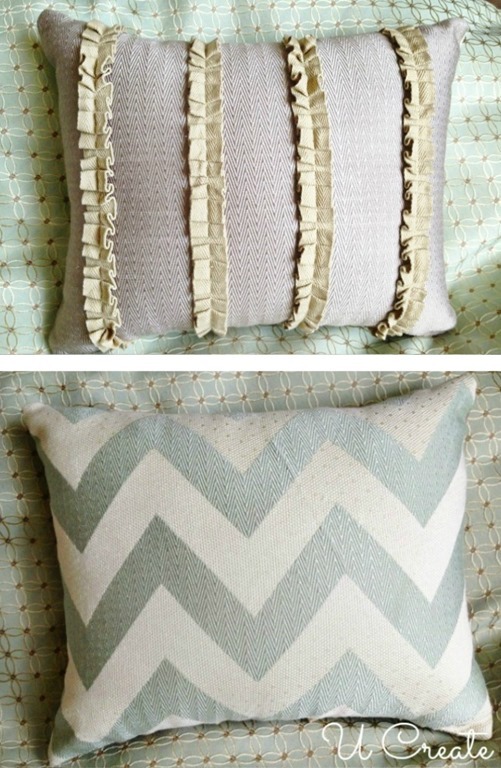 I’m crazy about throw pillows and for this bedroom remodel you will see lots of them! They’re going to be “easy to sew”, too. This pillow took me a total of 15 minutes! 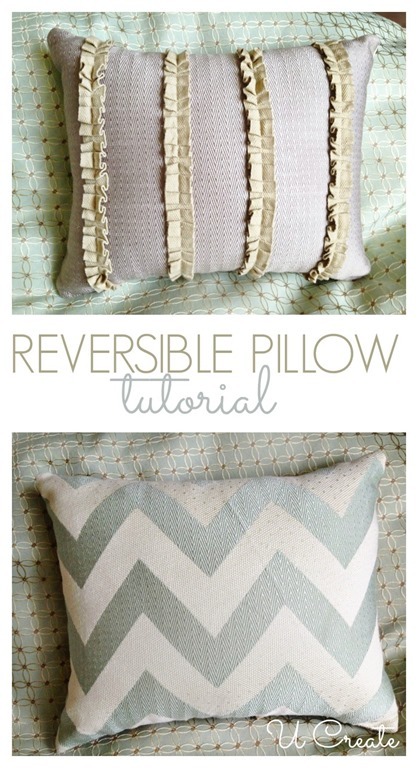 I love how I can turn it over and have a “two-in-one” pillow instantly! Two pieces of fabric (cut one inch longer than your throw pillow on all sides. 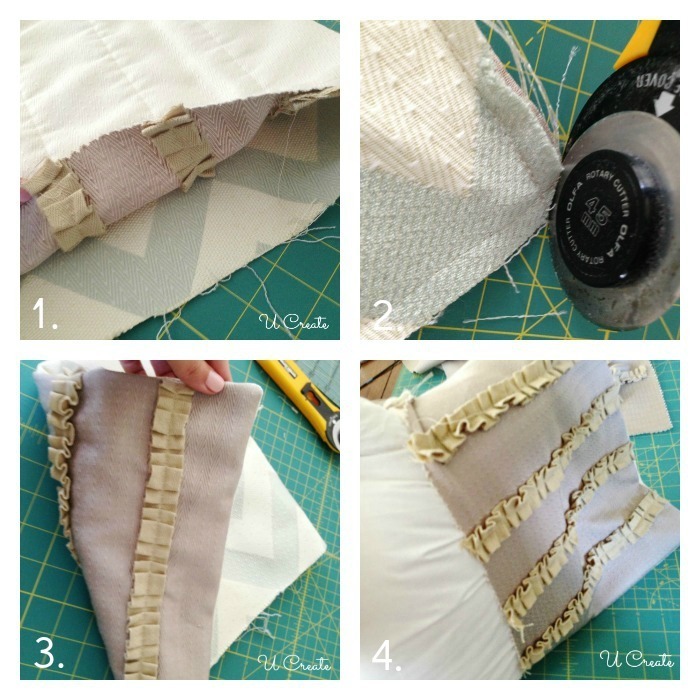 After your pillow pieces are cut you will want to embellish your pillow. I chose to use the new HGTV Home pre-ruffled trim – yes it’s already ruffled for you! Huge time saver right? It comes in many different colors, too. It’s a piece of cake to sew with. I just laid the trim and pinned it in three inch stripes. 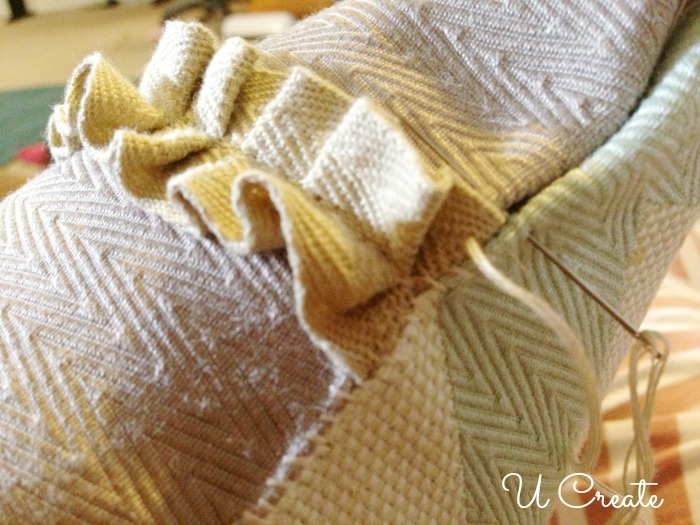 Place your sewing machine in the center of the ruffle and sew onto fabric. Trim off the excess. 1. Sew right sides (the patterned sides) together down THREE sides. Leave one side open so you can insert the pillow. 2. Cut off the corners without cutting the x. You don’t want the pillow to come apart. Doing this makes the corners pointier. 3. Flip the pillow cover right side out. 5. Hand sew the bottom of the pillow shut with needle and a thread. Enjoy your new throw pillow!! Make sure to follow the HGTV Home™ Magic with Fabric & Trim challenge. How lucky am I? I get to redo my master bedroom and play in this challenge with 3 of my crafty friends! The following review is part of the Jo-Ann Fabric and Craft Stores and HGTV HOME Magic with Fabric & Trim challenge. I received compensation for this review, however this is my personal, honest opinion based on my experience. Next Post: Master Bedroom Reveal! CUTE! Where did u get your adorable fabric?? You are very talented and clever lady.